Showers are gone. The wind has picked up. Cold air is now arriving. And there's still a potential snowstorm in the forecast for the weekend. The best word to describe Wednesday's weather forecast: Blustery. As expected, a brisk westerly wind has already picked up, with regular gusts between 30 and 40 mph throughout the day. (According to the NJ Weather Network, we've already seen a gust of 45 mph at Lower Alloways Creek Township in Salem County.) While temperatures will hover in the lower to mid 40s through late Wednesday morning, thermometers will start to tumble to the mid 30s or so by Wednesday evening. Meanwhile, we'll see a bright sunny morning, followed by partly sunny skies later on. A stray lake-effect snow shower may drift into northern New Jersey from NY/PA at some point too. As you might have guessed, Wednesday night will be cold. But not quite as frigid as you might think. My forecast shows low temperatures between about 25 and 30 degrees. Normal lows for this time of year are between 23 and 25 degrees. However, the combination of cold and wind is never an incredibly pleasant one. According to my favorite wind chill calculator, a temperature of 27 and wind speed of 20 mph yields a biting wind chill ("feels like" temperature) of 13 degrees. Bundle up! The brisk wind will continue Thursday, again possibly gusting over 30 mph. High temperatures will be limited to the mid to upper 30s degrees (maybe 40-ish in South Jersey). It will be a dry weather day, with periods of sun and clouds overhead. Friday gets even colder, with highs barely reaching the freezing mark in the lower 30s. At least it will be a bright sunny winter day. Then along comes the weekend. And we are still watching the potential for some snow in New Jersey. We're starting to see some model consensus regarding the track and timing forecast, but models continue to flip-flop and hem-haw and there is still a wide range of scenarios in play. I am restraining myself from offering more specific, more confident details until we have a few more model runs under our belt. The Big Questions: A fairly strong area of low pressure will pass to the south of New Jersey, riding along the southern edge of our newfound cold, dry air mass. Will that storm system come close enough to New Jersey to clip us with some snow? Will it slide up the coast, more reminiscent of a nor'easter storm track? 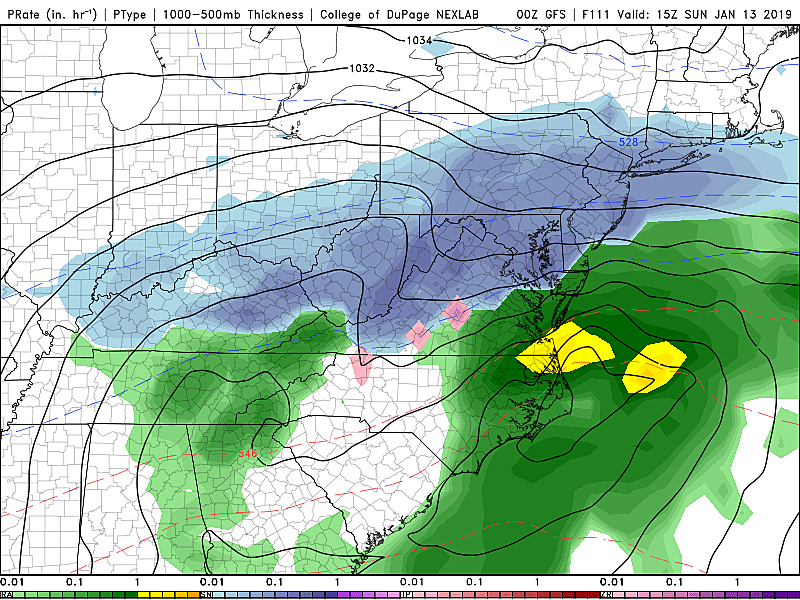 Will that storm system properly "phase" (strengthen dramatically) as it passes NJ? Or will intensification occur in the middle of the ocean? The Temperature: I have no doubt that thermometers will be cold enough to sustain almost all snow. I've seen hints of a transition to rain at some point in far southern NJ around Cape May County. But for all intents and purposes, for now, I'm "doing the math" and presenting a forecast that assumes no mixing. The Bullseye: Given the consensus storm track, southern New Jersey will probably see the most snow this weekend. A South Jersey Special, if you will. In fact, there could be a dramatic difference in snowfall totals from North Jersey to South Jersey. Advice: Hopefully you get the sense that we're still keeping several storm track and snowfall scenarios on the table. I'm hoping that a few more model runs will give us some more confident clues of what Mother Nature is going to bring us. In the meantime, I would recommend that you don't cancel your weekend plans just yet. For now, just continue to monitor the forecast carefully. My next weather blog will be published by 7 a.m. Thursday morning. Until then, bundle up, stay warm, and enjoy the January sunshine!